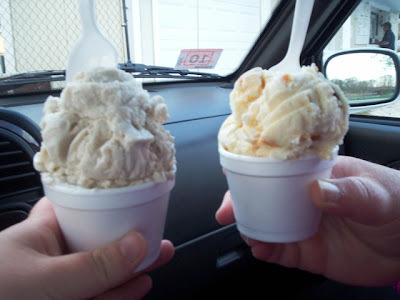 After our long drive home from Hyannis, Mom and I were in the mood for some ice cream. Since we were heading up to do some errands in Swansea, we decided to go to Simcock Farm. We read on a sign last week that the ice cream stand was opening soon, and we wanted to be one of the first to get a taste of Simcock's flavorful treats. We pulled into the crowded gravel parking area at around 6 p.m.
Simcock Farm is adorable. 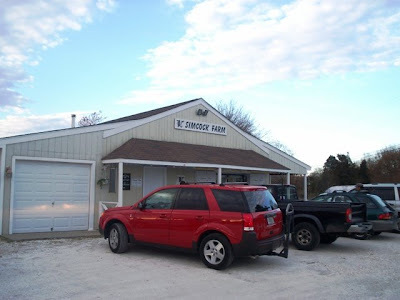 Not only is there an ice cream stand, it is also a working farm complete with fresh vegetables, dairy products, fresh cut flowers, candles, crafts, and seasonal specialties including hay rides and school tours. If you're lucky and live within a five mile radius, you can have fresh veggies and ice cream delivered to your door! There is even a bevy of friendly pets and farm animals that have become used to all of the attention they get from passers by. Simcock Farm also has a great Web site where you can learn the names of the critters, the history of the farm, and take a look at their family album. Since there were already people at the window, Mom and I stood at the wooden milk bottle that lists all of the ice cream flavors, including pistachio, cotton candy, peanut butter cup, pumpkin, chocolate, strawberry, frozen pudding, vanilla, coffee, cookies and cream, sherbet, and some sugar-free flavors as well. When it was finally our turn to decide what we wanted, I went with a kiddie cup of banana ($2.95) while Mom chose a kiddie cup of Snickers ($2.95). Why a kiddie cup, you ask? Well, we've had the small cup at Simcock before and it is HUGE. It's almost like an entire pint of ice cream. We usually stick with the kiddie cups because it really gives us just enough. Simcock Farm DEFINITELY does not skimp on portions. I'm afraid to see what the large cup looks like! The girl at the window scooped our ice creams and handed them over to me. The total came to *$6.20 (*I forgot to write the correct total down, but I'm assuming there is tax). Mom and I headed back to the car so that we could dig into our cups. Simcock Farm offers other ice cream treats such as sundaes ($3.50-4.95), cones ($2.95-4.25), frappes ($3.50-3.75), malts ($3.75), milkshakes ($1.25), ice cream sodas ($3.25), Holstein floats ($3.25), freezes ($3.25), banana splits ($6.25), and even a Frosty Paw treat - with cookie - for your dog ($1.25). Oh, and if anyone knows what a Holstein float is, let us know. Mom thinks it is a black and white float, possibly made with Coke or root beer and vanilla ice cream. Is she right? It's weird how sometimes two people are thinking the exact same thing, but it never gets mentioned because they each think that the other one would not agree with their statement. Although both Mom and I loved the taste of our ice creams (mine tasted like fresh bananas and Mom's tasted like an actual Snickers bar complete with caramel and fudge), we both agreed that the ice cream flavor is sometimes taken away by an aftertaste of freezer burn. There always seems to be tiny ice crystals in the dense ice cream, which takes away from the texture. 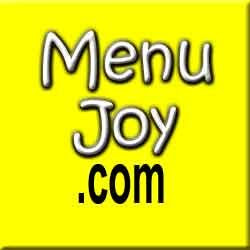 You'd expect the homemade ice cream to be creamy, however, because of the ice crystals, it comes across as grainy, and has the mouthfeel of an ice milk more than a premium ice cream. We're thinking that - because it's an ice cream stand - they may have to run their freezers very high. Other than that, we enjoy visiting this stand very much. As we left Simcock Farm, both Mom and I agreed that this is the kind of place that you'd want to end up after a long Sunday drive around New England, and that's exactly how it's advertised on their Web site. Mom and I are going to have to stop into the store and check out some of their other goods, but for now, we're glad that the ice cream stand is open and we look forward to going back and trying one of their other treats. Where else can you get a cup of ice cream that size for only $2.95? The Simcock Farm ice cream stand is open from 3-9 p.m. Monday through Friday, and 11 a.m. to 9 p.m. Saturday and Sunday.